I used to wear my hair that way ALL the time, back in middle school and part of high school too…Whether it was a messy hun (yes, I did rock that look back in the day) or just a half up, half down pony. 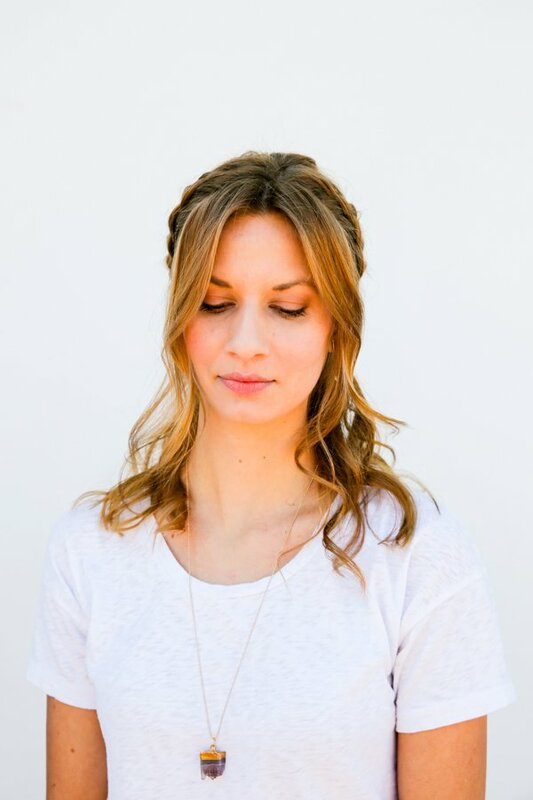 So, today we’re adding a new little twist to the trend and doing a something we’ve dubbed the half halo braid. Is that a thing already? I don’t know, but it probably should be. 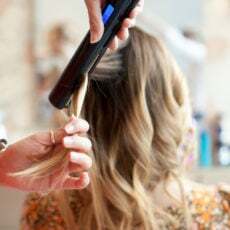 So easy and looks like you spent a lot more time on your hair than you actually did. 1. Start with curled or wavy hair. Prep roots throughout with your favorite texturizing product. This is the one Rachel, our hair guru, likes most. Works great and it’s not expensive at all. 2. 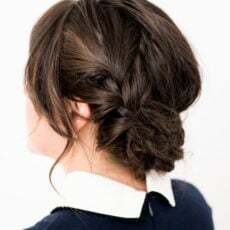 Next, taking the top half of your hair, split it into two sections and braid each with an inverted braid (as shown in the photos). 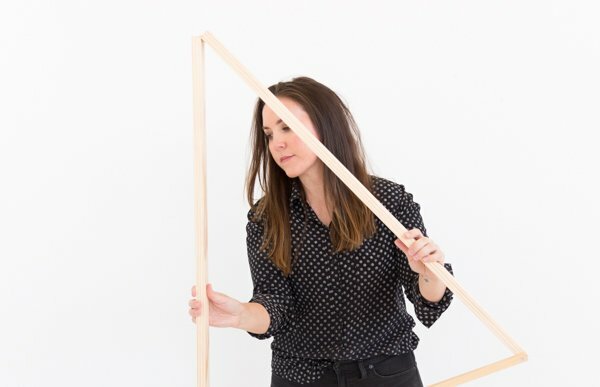 *Keep a couple of pieces out in the front, to frame your face, if you want a look similar to what you see in the photos. If not, just include those front pieces as part of your braids. 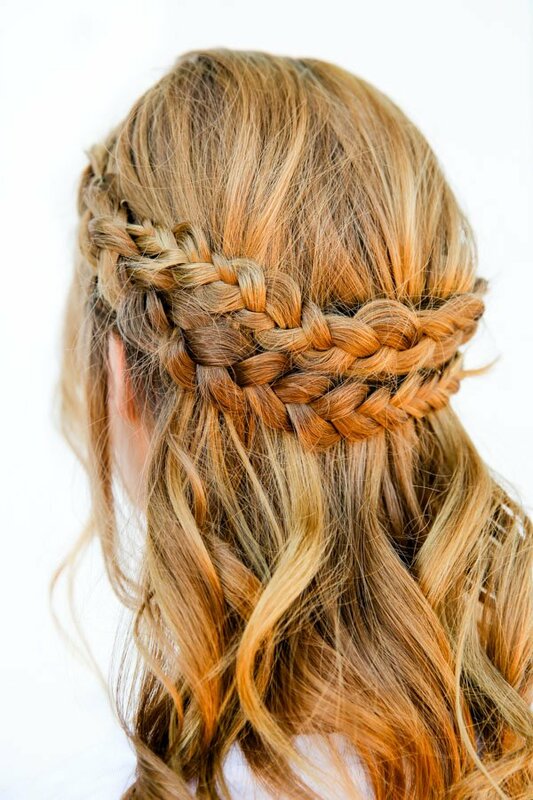 Note: As you’re braiding each side, make sure to leave your crown area out of the braids so that you don’t have a part down the back. 3. Once your braids are finished spread them by tugging at pieces to give it a loose, easy look. Feel free to add more texturizing product if you need more “messiness” from your braids. 4. 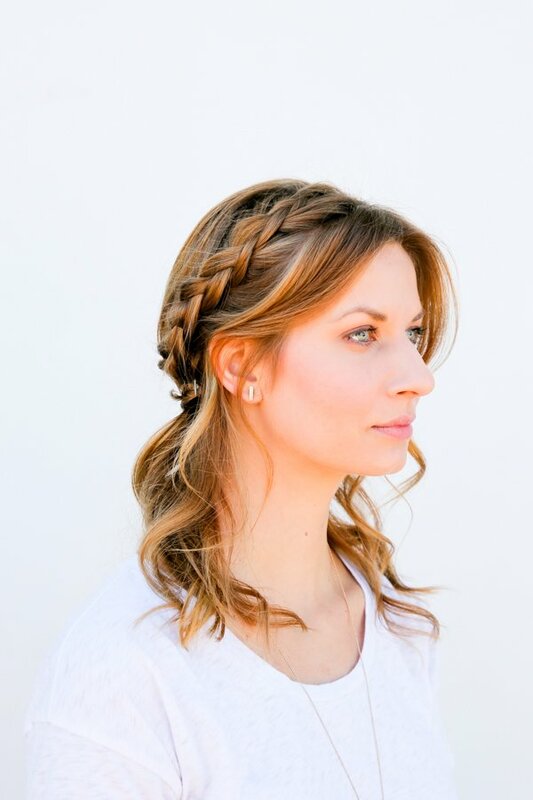 Wrap each braid around creating a halo look. And secure each with bobby pins, making sure to tuck in and hide the loose ends. 5. 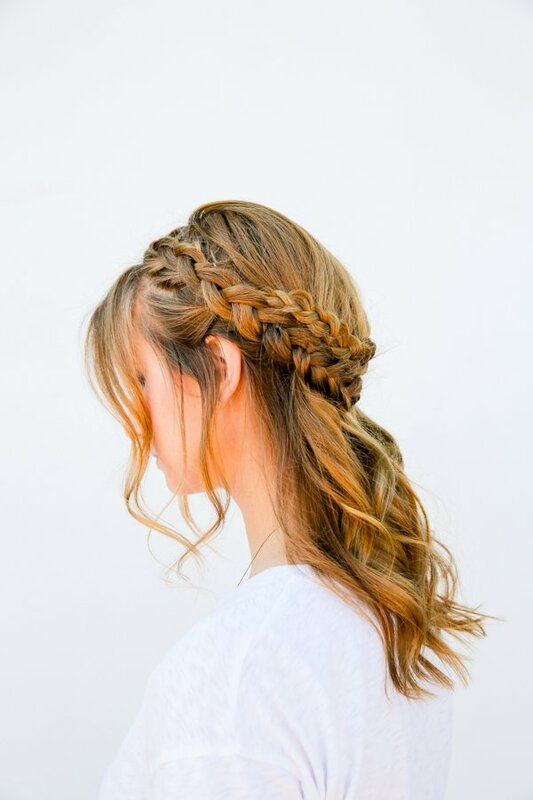 Finish by spreading your braids anywhere they might need it and add a spritz of your favorite hairspray. Done! Pretty simple, right? What hair trends are you loving right now? 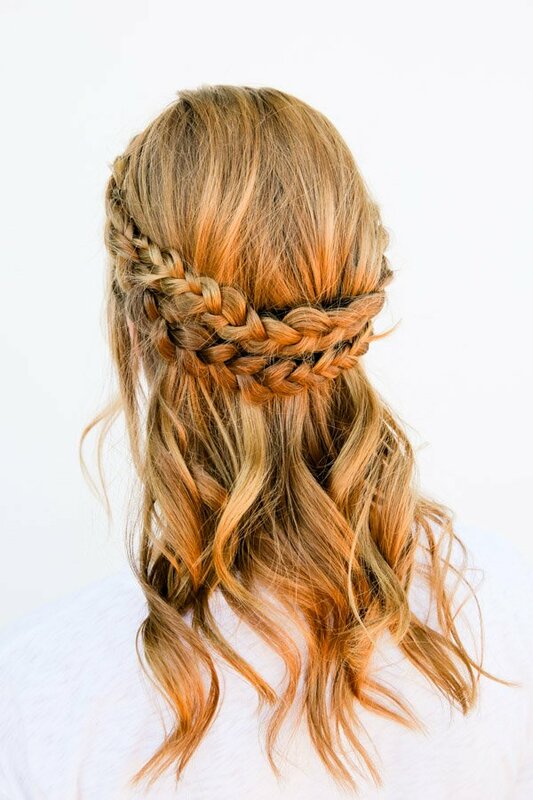 Think you’ll give this half halo braid a try? P.S. 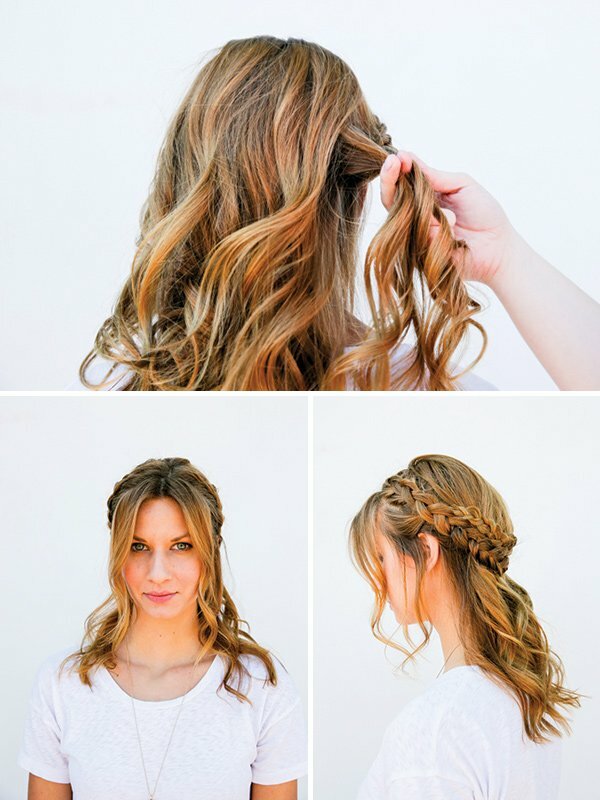 For more braid tutorials like this one, visit the braid tutorials page. How incredible does this hairstyle look?! WOW! I love it! Such a beautiful and so romantic look, that’s exactly what I like! Unfortunately the whole thing gets a bit difficult with layered hair, but I will try nonetheless. Thanks for sharing! Those braids are beautiful, B! It would be a nice break from the daily bun I’ve been sporting since 2012! Haha. Thanks Lex! Yep, it’s been bun nation over here too, for way too long. Nice to try out some new hair ideas every once in a great. Glad you like it Chloe. 🙂 Let me know how it goes. 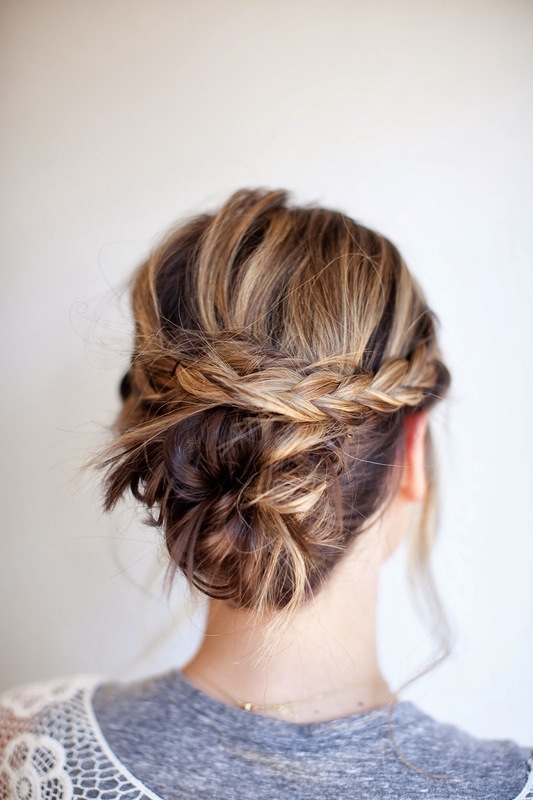 This hairstyle is so cute, and I think I could even manage to pull it off! So cool. Would love it if you could check out my new post on how to plan happiness in 2016! This is so cute and simple, love it. I wore a halo braid in my best friend’s wedding! I love how simple and elegant it looks, and it’s relatively quick and easy to do! Thanks so much for posting all the neat ideas!